I’m always tickled looking at the designs of Frank Furness (1839–1912), one of the most successful, and innovative American architects of the late 1800s. Despite the fact that he trained under architects schooled in the Beaux-Arts tradition of Baroque- and Renaissance-inspired revival styles, he certainly established a personal design aesthetic that discarded slavish imitation of past styles. His novel approach juxtaposed styles and elements of styles that were not necessarily of the same period or taste, and was equally innovative in combinations of materials. The Undine Barge Club, founded in 1856, was a bastion for wealthy white men in the sport of rowing. Having read the history of this club, I would imagine this was not a pastime of the masses. 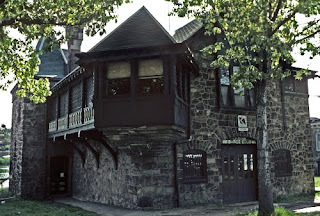 The Boathouse—built at a total cost of $14,000!—is located on what is now called Boathouse Row. It is a design that, in typical Furness fashion, combines Shingle Style with New England Cottage with Romanesque Revival. The low eaves; sleek, squat profile; and reserved use of ornamentation all prefigure the Arts and Crafts popularity that led to the work of Louis Sullivan (1856–1924, who was Furness’ draftsperson in 1873) and Frank Lloyd Wright (1866–1959). Furness first studied architecture in the office of Second Empire Baroque-inspired John Fraser (1825–1906) in Philadelphia in the 1850s. He attended the Baroque-revival inspired studio of Richard Morris Hunt (1827–1895) in New York from 1859–1861 and again in 1865. He was further influenced by the Second Empire Baroque work of Eugene Viollet-le-Duc (1814–1879) and the Arts and Crafts movement mentor: philosopher John Ruskin (1819–1900). Furness designed more than 600 buildings in more than 40 years as an architect. While he designed scads of different kinds of public buildings, including 153 stations for the Pennsylvania Railroad, I find his elegant mansions in Philadelphia the most interesting. They often featured, as is seen in the above image, external chimneys with corbelled brickwork, a Furness “exclusive” that was an influence of Gothic corbelling. The building underwent restoration in 1996. 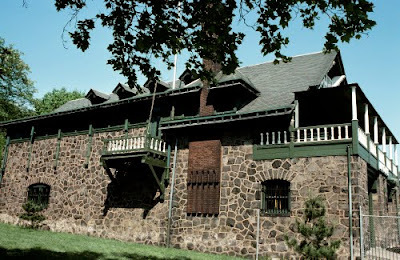 The Undine boathouse has a tower (to the left in the image above) that, while taken from the popular French Chateau revival style of the time, references the German fairy tale that inspired the name of the club. The story was by Friedrich de la Motte (1777–1843). It was a Romantic period story about a water spirit—living by the water with a poor fisher couple—who wed a knight in order to gain a soul. The story was turned into a German opera, of course (by Lortzing). 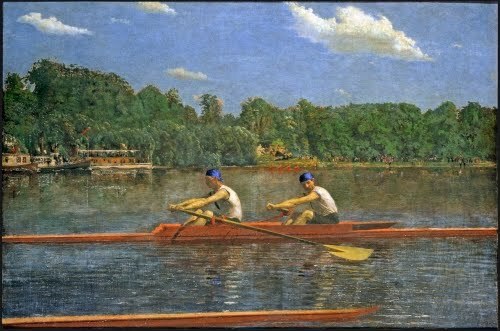 And….if rowing on the Schuylkill River in Philadelphia rings a bell with you, it’s probably because of this series of paintings Thomas Eakins (1844–1916) did in the 1870s, early in his career, when rowing was a popular spectator sport among the well-heeled. I’m not sure if the Biglin brothers were members of the Undine Club, but they were the subject of 11 paintings by Eakins.